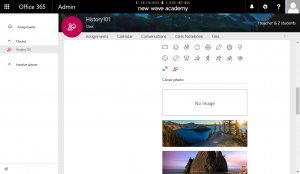 I’ve been chatting with a few friends and customer recently about Office 365 Education and it is interesting to hear what different people have to say about the product, where they are and where to go to next with the cloud. As a result of this I’ve put together a survey which I’m hoping you will fill out about how you are using Office 365 Education and where you are going next. We aren’t asking for any personal data, just about the type of establishment you are, where in the world you are and then a bunch of questions about how you use and planning to use Microsoft cloud products. The survey is open until the end of January with the results available during the first week of Feburary 2018. All results of the survey will be shared online (I’ll create a fancy PowerBi report) and I’ll give a bit of a state of the nation review of it. There are 25 multiple choice questions using Microsoft Forms and should only take a minute or two to complete it. So in the interest of sharing – please do complete the survey and look forward to sharing the results with you at the end of the month and thanks for taking part. 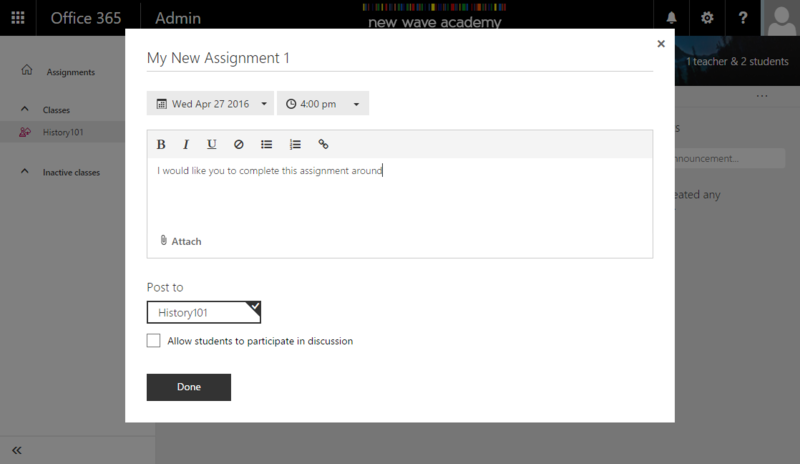 What a week it has been for the education team and Office 365 with way to many announcements for us to get into in this post. 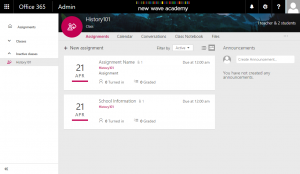 The Microsoft Education team announced Microsoft 365 Education along with some licensing changes from the 1st October, some of these are in your Office 365 platform already. 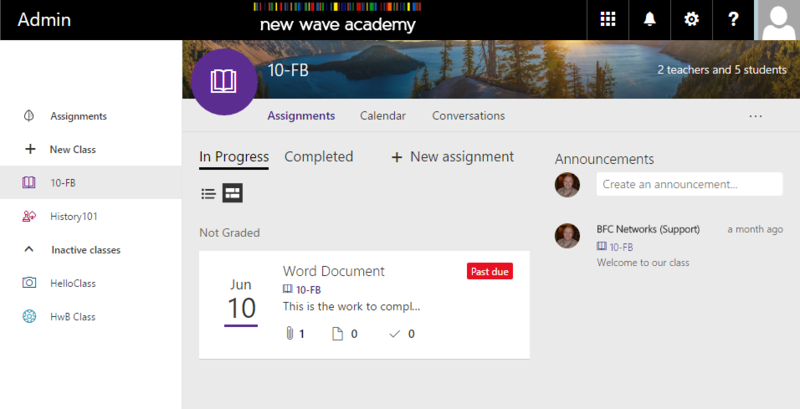 The Office 365 Education license now becomes the Office 365 A1 license and you will soon be able to change your license agreement to match Microsoft’s vision of Cloud-First, Mobile-First. This week also saw Microsoft host the Ignite conference with a large number of announcements, changes and improvements to all their products including Office 365, Azure, SQL and the future release of the Office 2019 productivity stack. Below I have put some links we feel should help you to understand the changes so you too can be ready to support your end users. In recent years we have seen Microsoft announce data centres across the world and more importantly for my point of view a set of them in the UK. 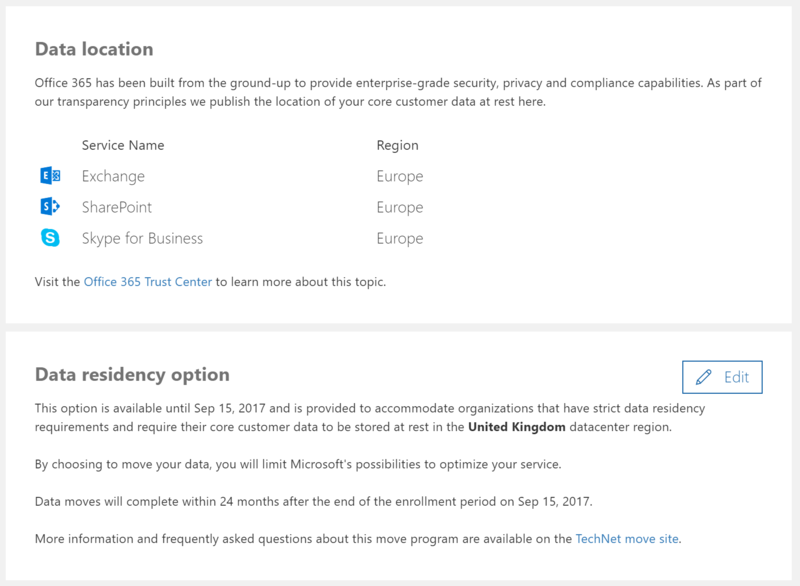 Azure services can now be purchased to house your services in the UK with new Office 365 tenants being created in the these new data centres. 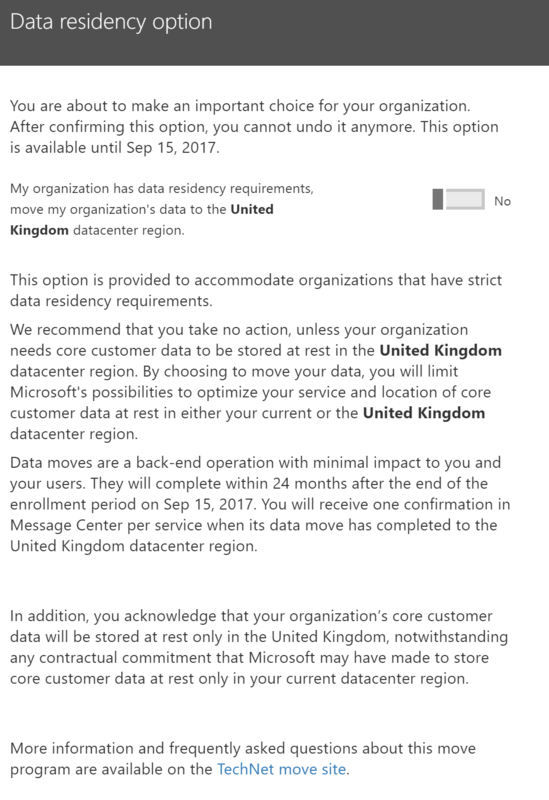 Did you know you have to opt in to get your current Office 365 tenants moved to the UK? Did you know you have only until the 15 September 2017 to complete your request? Well hopefully you do now. If you navigate to the Admin Centre in Office 365, Settings and then Organisation you will see while navigate down the page it talks about where your data is located. Below that is the notification around moving you data. Ensure you understand what the move process is and how it effects your organisation and chat with Microsoft or visit the Trust centre if you have more questions. Thanks to Pugh and BFC Networks for allowing me to present on Microsoft Classroom today. During the call we went through a few different aspect to help understand what you can do with a Microsoft Classroom class. 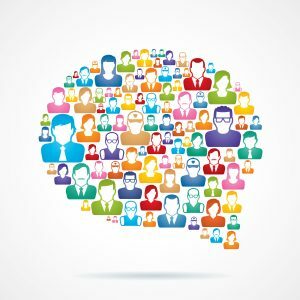 What is an Office 365 Group? Today I’ll be presenting on Microsoft Classroom and School Data Sync, giving live demos and asking any questions you might have. It is great to be able to partner with Pugh and my own company BFC Networks to present this and will continue to do so every other month with a date set for our next meet up in September (after the summer break). Sign up at Eventbrite look forward to speaking to you then. 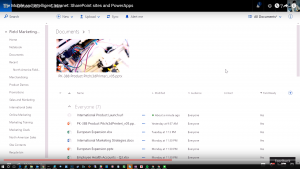 On the 4th May, Microsoft hosted a 2 hour webinar demonstrating what they are bring to SharePoint 2016 and SharePoint Online in Office 365. In the announcements they shared new features that are currently in Office 365 and their mobile apps as well as what they are developing. 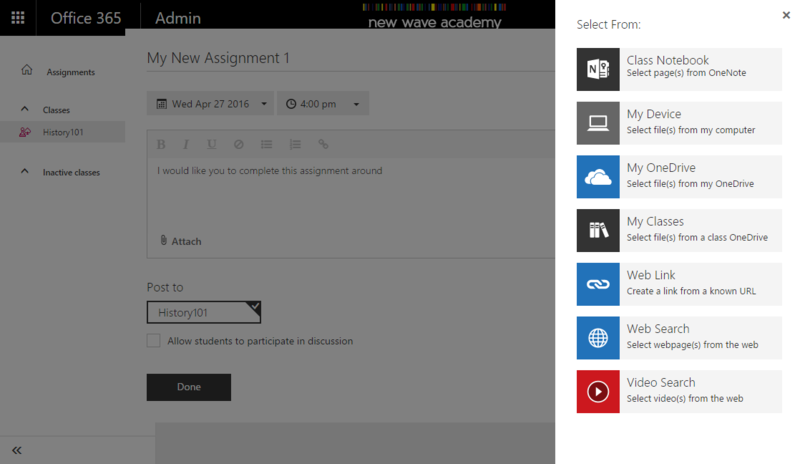 As Office 365 Education is free, we are going to get these new features allowing you to get all these when they are released. Here is a bit of a summary with an education twist with some ideas of what you could do when it is available. We work with students, the millennial generation – always wanting to use their mobile phone for communication. 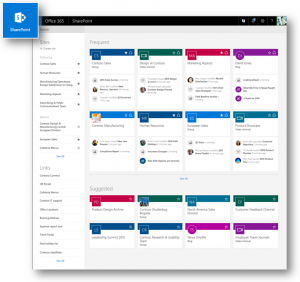 There were a few announcements around mobile access to Office 365 and files within Office 365. The OneDrive iOS app received an update yesterday allowing you to access both your OneDrive files but also SharePoint site document libraries. In this latest update, you will see the Sites tab at the bottom which will then allow you to see all the sites you are following. When selecting your site, it will then list the document libraries you have in that site. For those who use document libraries a lot as a shared document location, this is the perfect feature allowing you to access those files when you need them. The sites you see are your “Follow” sites which you set in the top right of the site. The app allows you to take files offline and edit them with your Office client which you will have a license for if you have an EES agreement and the Office 365 Education Plus licenses. Getting students and staff to click that “Follow” button is important for their navigation – I haven’t yet found a way to do this based on a group so it has to be done by the user. 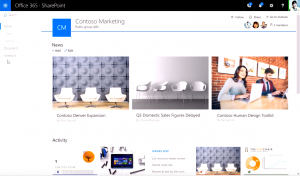 Microsoft also announced a SharePoint Mobile app and demonstrated this but it is important we take a look at other announcements around this first. 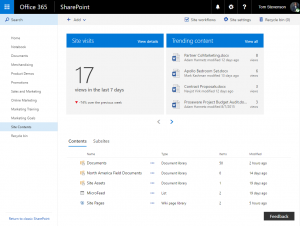 The first thing to note is that we will be getting a new landing page for SharePoint. In the app launcher, where you see Mail, Calendar etc you will also see Sites. 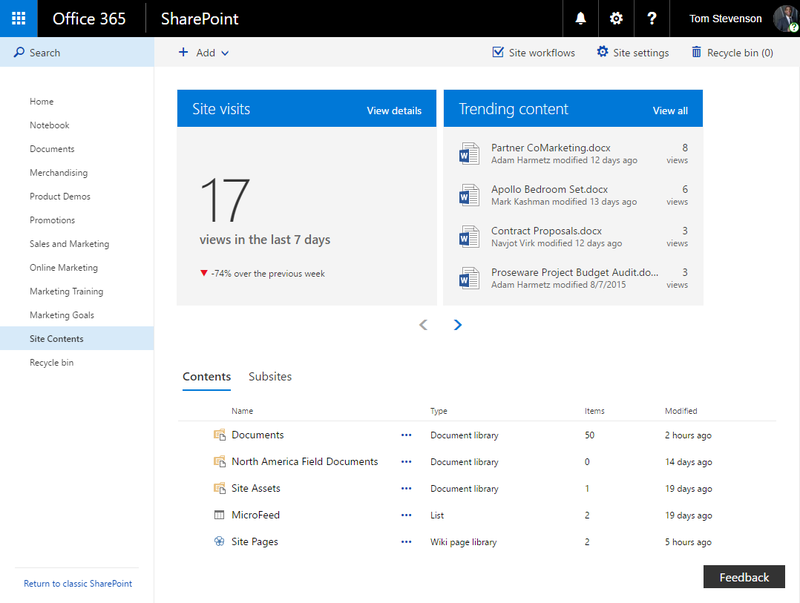 This will change to SharePoint with a new landing page to help you navigate around all your SharePoint team sites. The left navigation is giving you the sites you currently follow – the same way you have sites in the mobile app above. Next we have Recent, sites you have accessed but not marked as “Follow”. We then have Links. The main page is split in two Frequent and Suggested. I don’t yet know the difference between Frequent and Recent but I’m guessing that Frequent are sites you visit often and files you use. Suggested are recommended sites that it finds based on the other sites you follow and access. 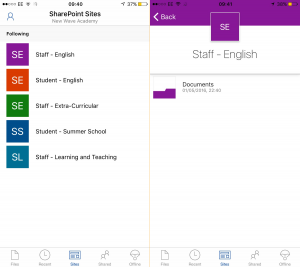 The home page is based on the Office Graph (linking people, documents and email together) so will always look a bit different based on the students work and files they access. Each site comes with a board (as they are known in Delve) showing recent information but also the template type such as Group, Blog and Video Channel. 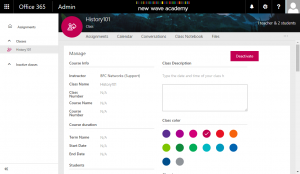 If you are a heavy user of SharePoint in you school, college or university, this can be a great way of accessing the content that is important. Getting the “Follow” system is also right so teachers can see the Staff areas for the whole organisation but also their departments. We also want to make sure they can access any class sites and SharePoint Apps as well when they first arrive, not just when they have discovered their classes and sites. 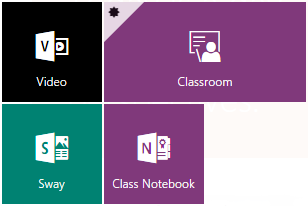 One of the biggest frustrations I get from my education customers is that different devices in the classroom have with different screen sizes and a lots of websites and some of Office 365 has a responsive design. SharePoint has been lacking in this space. 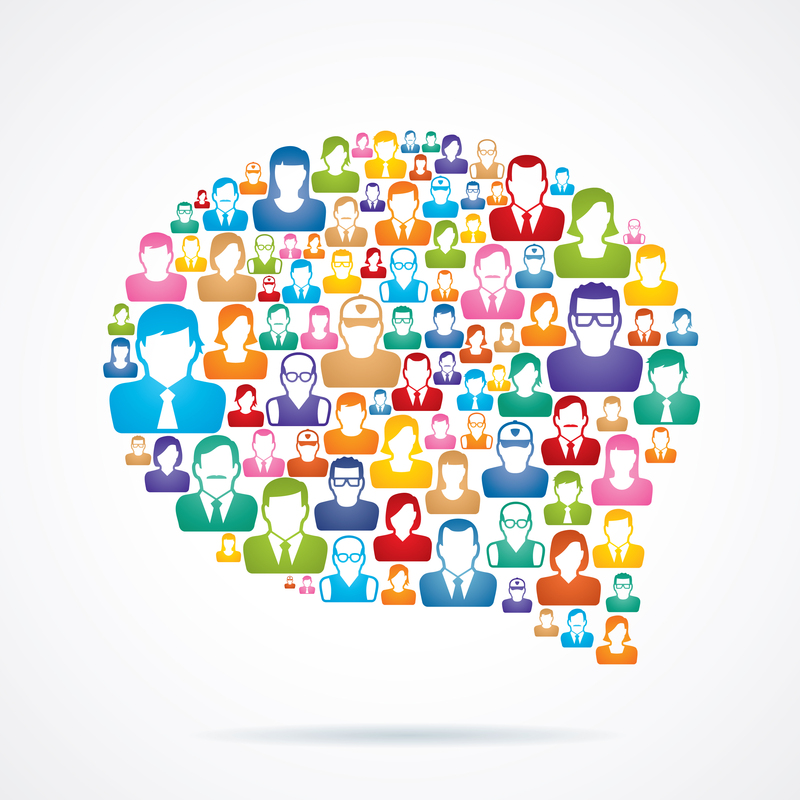 Published content can be added to team sites and helps to form news from your organisation. You will be able to see this news both in a mobile app but also in the browser. 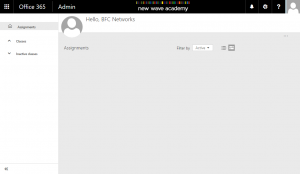 Using the Office Graph, you will be able to see Blogs, News articles and other information as it is published keeping you up to date. The responsive design of the new team sites, blogs and pages help to form the content at the screen size of your choice without any additional work. With the SharePoint Framework (a new development model) your SharePoint partners and app providers will be able to build into these allowing you to have both your news but also information from external sources such as your MIS. Creating Sites has become easily and will also provision an Office 365 Group so you get all you content, lists and files along with the communication and collaboration with Jeff Teper stating it will take around 5 seconds to create these when released. There are two options. 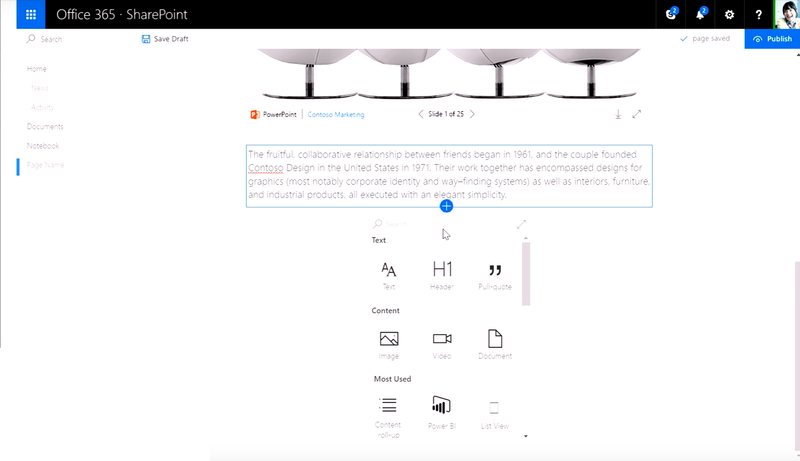 A team collaboration site or a publishing site – the team site will create the Office 365 Group for your team while we didn’t get to see the publishing template. Team sites have taken a new name. 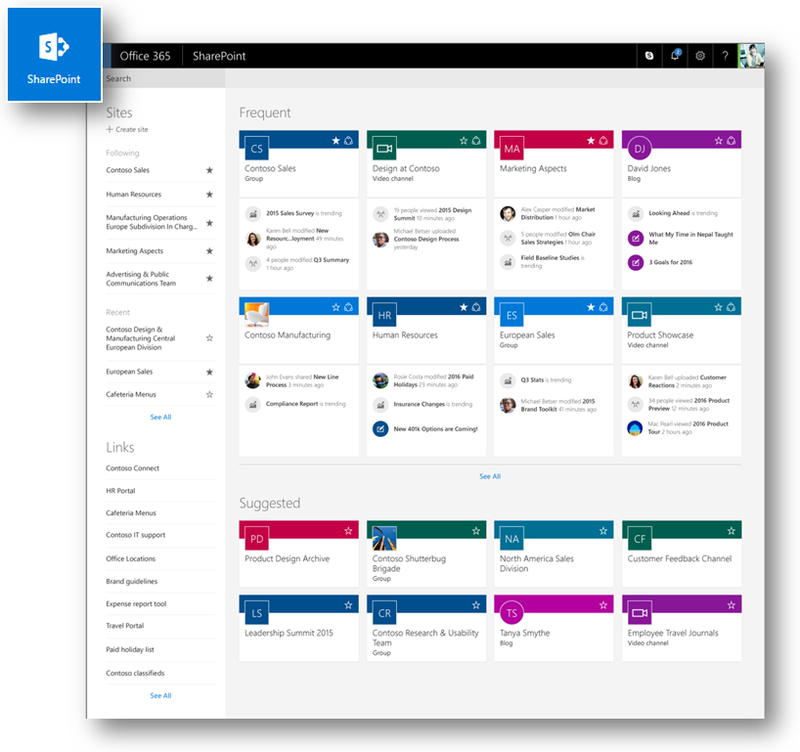 What do you get when you mix teams sites and the modern Office 365 Groups? That’s right, modern team sites! You can still create your normal document libraries, lists and add meta data to sites but we get a few other options. When we create a modern site, we are asked what compliancy level we would like to set it as, something we can set in the compliancy centre in Office 365. The main new feature that I could see is the ability to spotlight content from the site in the News and Activity area of the site. These are also shown on the mobile experience and documents and pages can be pinned to the top for news and activity is drawn up by the power of the Office Graph. 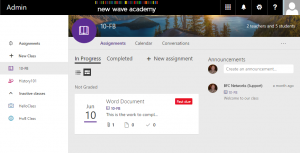 Imagine a class now having an Office 365 Group which is part of Microsoft Classroom but now we can also add all sorts of content into our site, pinning files and pages to the top based on the lesson you are teaching. Site Content will now tell you how your class site is being used. Schools still talks about wikis and the need to create pages. Pages in the new sites are easy to create and very similar to Sway without all the styling. Easily add a banner, content, documents, document libraries and other web parts to the pages. 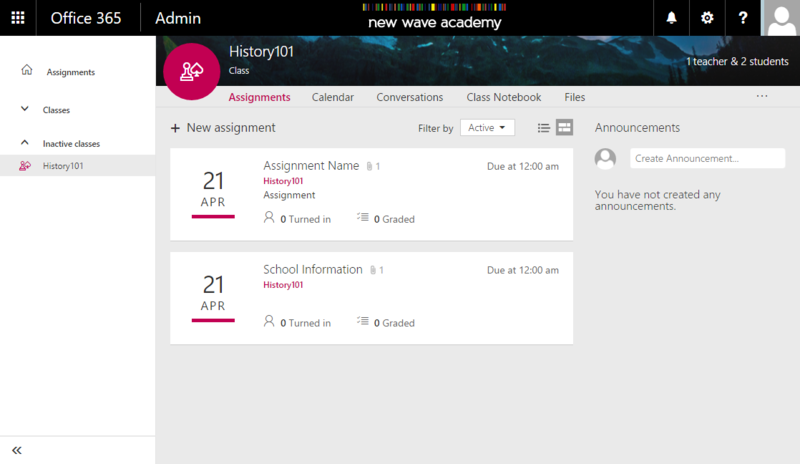 The teacher can create a page on a per class or topic allowing students to get the documents, images and other systems that integrate with SharePoint all in one page (a little bit more than what Sway offers). 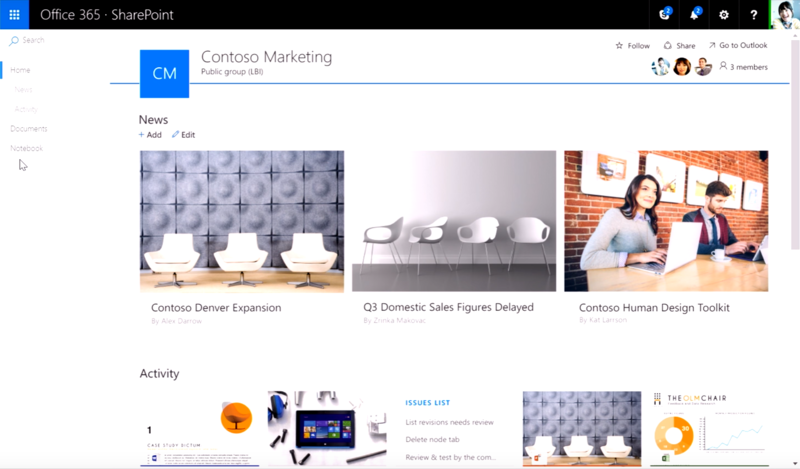 It will also build the page as responsive design so it can easily be read in the SharePoint app. I should add here – no more stupid web part galleries – a lot easier when you click on the plus, it gives you the options. For those of you who have First Release enabled in their Office 365 Education tenant. You may have seen a new layout to Document Libraries. This will be released to all documents over the coming months giving the same experience as your users get in OneDrive. If you navigate to a document library now, you will see this experience but in the demo and videos they showed the ability to pin documents to the top of the library. Again something useful if you want students to be able to see important documents for that lesson. Lists have become easier to manage, filter and edit with quick view, a fly out option to update the meta data but also the ability to create your own views that can be accessed in the browser and the browser through PowerApps. 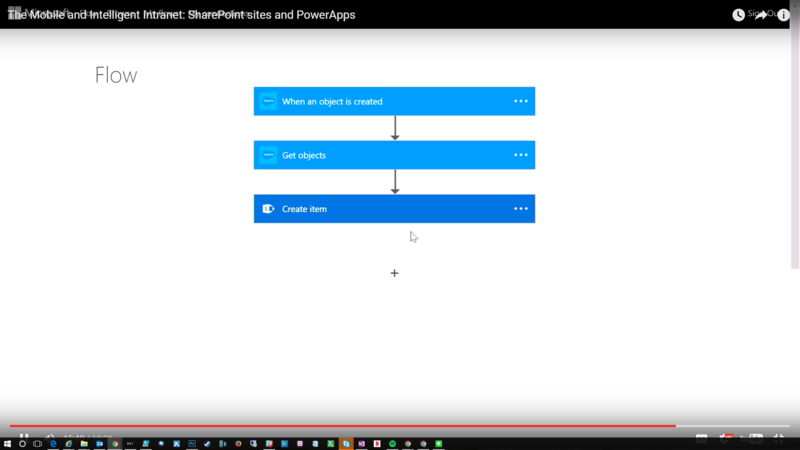 We’ll take a deeper look at PowerApps another time but there are some great features here. PowerApps has just arrived as Public Preview so you can access it now. Have you ever wanted to create a simple workflow so when something happens to a file or item in a list, it emails your or something else with a third party product – some of you may have done this already with SharePoint Designer. Microsoft Flow will give you the ability to do this in a visual way in the browser. 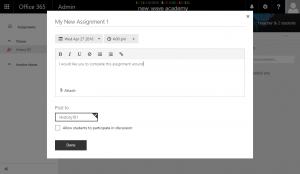 Are you expecting all your students to upload their home work to a document library and you want an email to tell you that it has been uploaded. 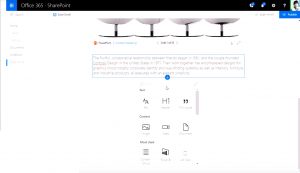 You can create these in the browser using this new features in Office 365. Well if you are still reading, you have realised that there is a lot to this the announcements. I almost found it too difficult to take it all in and we haven’t even talked about the new development framework called the SharePoint Framework, the hybrid options, SharePoint 2016 and that a lot of these features will come to your own environment during 2017 in Feature Packs. I hope this gives you an insight to what can happen with the free platform and the opportunities you may get from it for your education establishment.